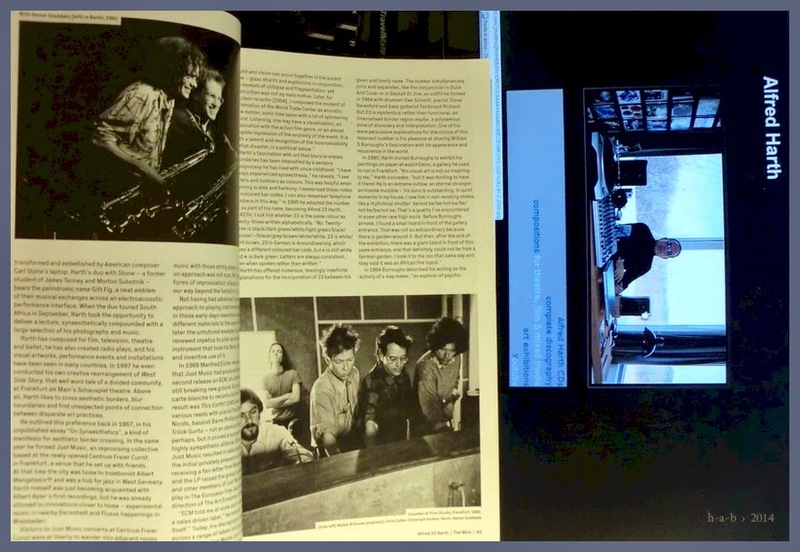 Nel numero di questo mese della rivista The Wire Julian Cowley firma un ritratto del poliedrico sassofonista Alfred Harth scrutando gli attuali orizzonti della sua incessante creatività e ricordando le vicende musicali e artistiche del passato, le collaborazioni e le autoproduzioni: Just Music e Gestalt et Jive, EMT e Cassiber, i sodalizi con Heiner Goebbels e con Otomo Yoshihide, Viriditas, Trio Trabant a Roma e Oh Moscow! tra le tante. Born in 1949, Alfred 23 Harth grew up in Frankfurt am Main in the aftermath of the Second World War, belonging to a generation caught up in the complicated process of West Germany’s emergence from the shadow of totalitarianism and readjustment to democratic values. In 2001, he moved to Seoul with his wife, artist Yi Soonjoo. His current creative base, LaubhuetteStudio Moonsun, is situated just a mile from the extensive Demilitarised Zone that runs between South and North Korea. Julian Cowley speaks to the multi-instrumentalist and multimedia artist in The Wire 369: “Nearly daily I am confronted with border issues,” he says. “Recently, during one of my regular midnight walks in the magic rice fields by the DMZ I saw a moving star, blinking on and off, with no mechanical sound. Next night, there it was again, moving in the opposite direction. During seven years out here, working in my studio, I have never seen a plane – they’re forbidden in this region. Was it perhaps a secret night flight?"